Thomas Klau used to work for ECFR as Senior Policy Fellow and Head of the Paris office. As part of the ’Reinventing Europe' project, ECFR is publishing a series of papers on the national debates within EU member states over the crisis and the future direction of Europe. In the fourteenth of the series Thomas Klau analyses the situation in France. On Thursday EU leaders will meet in Brussels to discuss the EU budget for the next seven years. ECFR experts in Spain, the UK, Bulgaria, Denmark, France, Germany and Italy tell us what to expect. The implosion of Greece's party political landscape and the victory of François Hollande in France transformed the political debate in Europe. Moreover, both events act as a catalyst for a political reinvention of the eurozone and an emergence of a transnational political space. The prospect of a victory by François Hollande may be causing nervousness in Berlin and elsewhere, but the socialist candidate in the French presidential elections is a natural compromise-builder, and Europe should have no real reason to fear his victory. As France votes in the first round of its presidential elections, the French people have been denied an analytically, politically honest and comprehensive engagement by the politicians with the real issues at hand in France and Europe. The economic crisis is now at a critical point, and Europe's leaders must chose between a federated eurozone power or yielding to the power of the markets and economic and political disruption. Throughout the Eurozone crisis, France has been well served by its decisive presidential system. 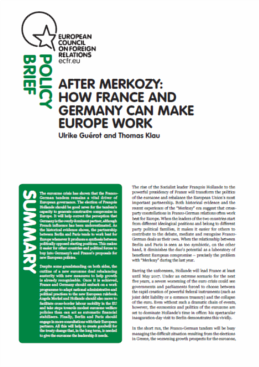 But as thoughts turn to reforming the way the Eurozone works, France must come to terms with the power implications of a more federal system. In this contribution to an online Economist debate on the future of the euro, Thomas Klau argues that the single currency is indispensible if Europe is to punch its weight on the global stage in the 21st century. Thomas Klau writes on the European diplomacy for La Croix. Thomas Klau quoted on Juncker's candidacy. Thomas Klau comments on the results of the EP elections. Thomas Klau is interviewed on the TTIP. Thomas Klau comments the transatlantic cooperation between EU and the U.S. in the context of crisis in Ukraine. Thomas klau is part of a debate on Europe and the media, hosted by the Jean Monnet Foundation. The video of the whole discussion is available online. Thomas Klau answers questions on German concessions towards the UK on European policies.